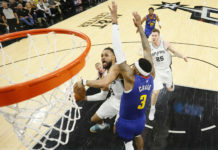 The Denver Nuggets came into the 2018 trade deadline looking to move off of Emmanuel Mudiay and to find a veteran point guard to help solidify the bench unit and they did so with aplomb. 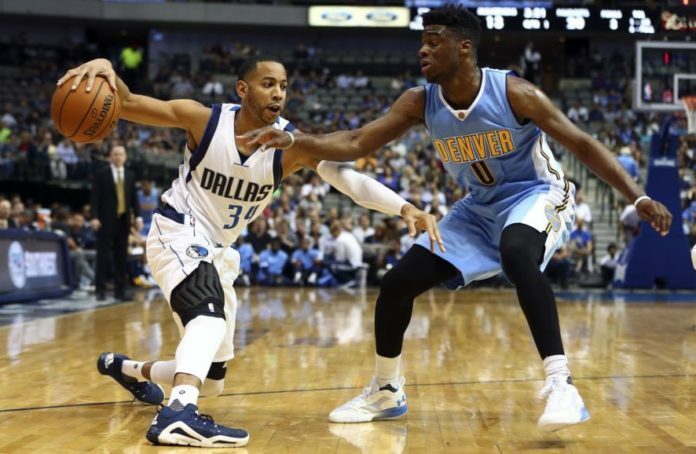 The Nuggets pulled this off by acquiring Devin Harris from the Dallas Mavericks and trading Mudiay to the New York Knicks in a three-team deal. Doug McDermott also was included in the deal and is now headed to Dallas. 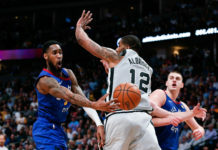 The Nuggets also swap second-round pick with the Knicks in the process so Denver now owns the Los Angeles Clippers second-round pick as well as their own. Harris is a 13-year NBA veteran who will provide shooting and backup ball-handling for the Nuggets. Harris is averaging 8.5 points, 1.9 rebounds, and 1.9 assists while shooting 41.5 percent from the field and 35.2 percent from three in 18.3 minutes per game. While those numbers may not jump off the page, what is important is how he produces and how his skill set will translate to the Nuggets. When looking back at the numbers that Harris put up for the Mavericks when he was on the floor, it is easy to see how he will be able to immediately help the Nuggets. 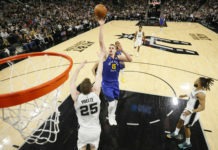 When Harris was on the floor for Dallas, the team put up an offensive rating of 109.6 and a defensive rating of 102.8. When he is off the floor, the offensive rating plummets to just 101.6 and the defensive rating becomes an abysmal 108.3. 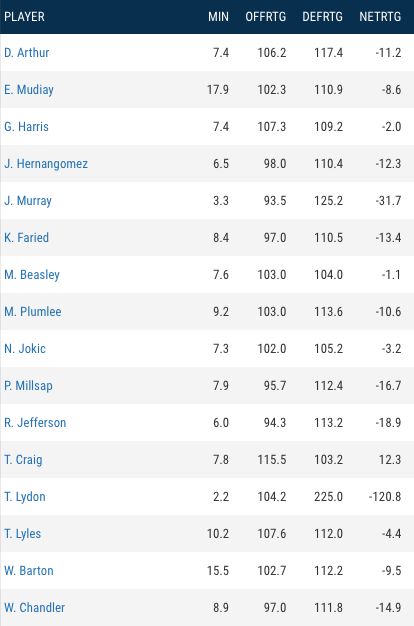 That is a net rating change of +13.5 for when Harris is on the floor compared to off of it. To put that into perspective, when Mudiay was on the floor, the Nuggets had a team net rating of -8.6 thanks to an awful defensive rating of 110.9 and a lackluster offensive rating of 102.3. When Mudiay was off the floor, Denver was a +4.1 in net rating with an offensive rating of 109.8 and a defensive rating of 105.7. That is a -12.7 difference in net rating. To put it plainly, Mudiay was keeping the Nuggets from being a playoff contender. He was a plague that overcame the Nuggets nearly every time he entered the game. Every single one of his teammates was negative in net rating when they play with Mudiay except for Torrey Craig. Oh, you don’t believe that could be true? Here is a chart from NBA.com on every player’s numbers with Mudiay on the floor. Now the Nuggets can move forward with a backup point guard that fits exactly how they want to play. Harris will fit like a glove with this Denver roster and will help Jamal Murray’s continuing advancement as a point guard and, if the going gets tough or adversity hits, Harris will be able to be relied on to help get the Nuggets back on track. When looking at Harris’ efficiency as an offensive player, it is hard not to get too excited. As a spot-up scorer — his most common play type at 26.1 percent of his offensive scoring possesions — Harris is in the 73rd percentile and scores 1.09 points per possession per Synergy and also knocks down 42.4 percent of his catch and shoot three-point attempts. Harris is even better as an off-ball cutter. He scores 1.51 points per possession on cuts and that puts him in the 90th percentile. He is a smart cutter and gets nearly one shot off of a cut per game according to Synergy. Bringing in Harris will allow the Nuggets to continue playing the same style of basketball for 48 minutes and, hopefully, will help keep the bench unit above water. The Nuggets have lost countless leads when going from their starting-five to their bench unit and bringing in Harris should remedy that issue. Even without Harris taking the court for the Nuggets, one thing is for sure: the Nuggets got better by bringing in Harris and trading Mudiay to the Knicks. Harris fits the offensive style better, is a better shooter, and understands his role. Wonderful job by Tim Connelly and Arturas Karnisovas once again.